As the newest member of Saucony’s growing Track & Field footwear collection, the Showdown 2 is—you guessed it—an upgraded version of the original Showdown. With a natural running inspired FlexFilm upper, and a Pro-Lock lace system, the Showdown 2 the strongest and lightest sprint spike ever created by Saucony. 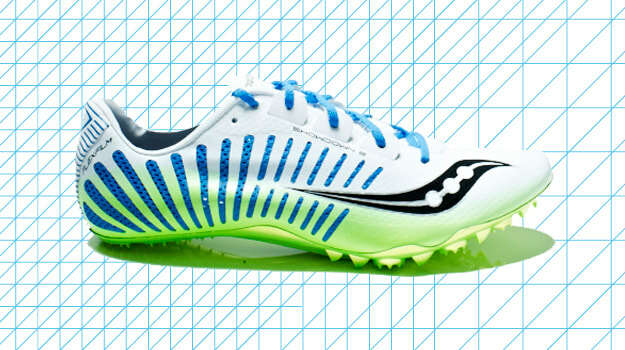 The Showdown 2 is an elite level spike designed for 100M-400M races. It features a 10-Pin Pebax spike plate that is tuned to help sprinters explode out of the blocks on your way to the finish line. The outsole is studded with 1/4 inch pyramid spikes for optimal speed, and a FlexFilm upper that wraps around the foot for a locked-in, yet flexible, fit—not to mention it&apos;s easy on the eyes. As for the fit, the spike has a medium arch height, and runs narrow pretty much from heel-to-toe (something to consider if you have a wide foot).